Item Number: 3709 Case Material: Steel & Gold Reference: Chronomat B13050.1 Steel & Gold Band Material: Original Rolle Bracelet with folding clasp Movement: Mechanical: Automatic Dial: Blue index "Panda" dial with small seconds subdial at 9, date at 3 & 2 chrono subdials at 6 & 12 Case Size: 40mm Box Papers: n/a Retail Price: n/a Condition: Excellent condition ready to wear and enjoy! Product Reviews Write Review Write Your Own Review How do you rate this product? 5 stars (best) 4 stars 3 stars (average) 2 stars 1 star (worst) Write a headline for your review here: Write your review here: Your email: We promise to never spam you, and just use your email address to identify you as a valid customer. Enter your name: (optional) Enter the code below: Save My Review This product hasn't received any reviews yet. Be the first to review this product! 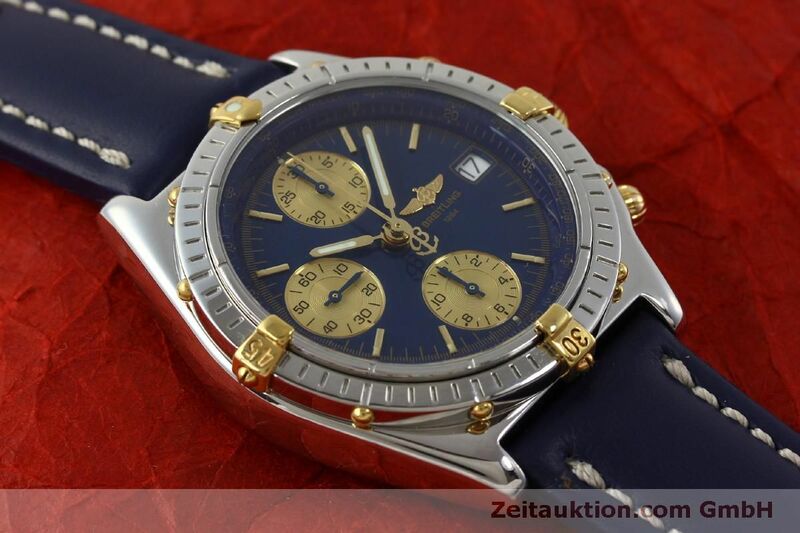 This is a Breitling B13050.1 Windrider Chronomat Automatic with UTC Stainless Steel and Gold Gent’s watch. The dial, case and clasp are signed Breitling. Please note this watch is pre-owned and does have signs of wear. The watch will be supplied with a replacement (non- Breitling) box and international warranty showing the date of purchase 31/1/1996. Paypal or Bank Transfers only. All goods will only be sent once payment is cleared.